Alright, babes, I am offering you the opportunity of a lifetime today. I have talked in the past about blogging roundtables and many of you have mentioned that you would like to do an online roundtable since you don't live where I live and can't that just be possible pretty please?!? I am stoked to be teaming up with Erin from Living in Yellow this month to do just that. 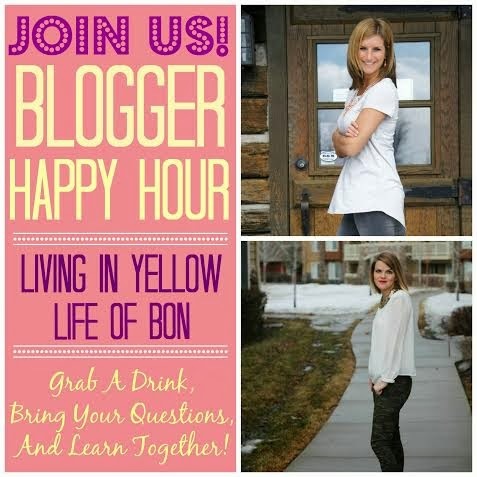 We are holding two blogging "happy hours." We get together for an hour on google hangout and you fire away any question you may have about blogging. It's $20 and one of the best ways to fill your brain with everything blog related. I always learn so much from picking the brains of other bloggers... no matter where I am in blogging I find it invaluable to beg, borrow, and steal the ideas of others. The dates are March 11th and March 20th at 7 pm. On the bottom of the post is a passionfruit widget you can pay through if you are interested, or if all else fails, email Erin at livinginyellow@gmail.com and she'll get you hooked up. Here I am staring at my freaking blank screen at 9:14 pm and I don't have one idea of what I am going to say to you tonight. Reason #1: I don't like blogging about weekends. My weekends are great and everything, don't get me wrong. I just don't know that they are necessarily post worthy. So most of the time I don't mention them at all unless Greg was puking his guts out or we lost all our money playing blackjack or something. When I do try to post about a normal weekend I bore myself with the post. Weekends are great to live. Not so great to read about. Reason #2: Sometimes I am embarrassed to be a blogger. I even kind of hate the term "blogger." It feels like I don't belong in it. You know when you just start dating a guy and you feel weird every time he calls you his girlfriend? It's like that. Also, pretty much everybody I know gives me a hard time about being a so called "blogger." Don't get me wrong- it's all in good fun- but it's also somewhat mortifying. "Hey, guys, Bon just got out her camera! This is going on the blog!" "Oh hey Bonnie. Heard you got yourself your very own blog!" and of course, my students, "Hey teacher! How's the Life of Bon going?!?" It's mortifying. I always just kind of duck by head and pretend like I don't know what they are talking about. I practically disown my blog on the daily. Shouldn't a good blogger be loud and proud about her space on the interwebs?!? Reason #3: I always forget to take pictures. Either that, or I feel super lame pulling my camera out. For example, Friday night we hung out with all of Greg's friends. It was real fun! They were all dudes! Four of them, in fact! I was the only girl! We ate a gross dinner and then wasted money in a way I would rather not discuss. Just me and the boys! I wanted to take a picture of it, but it just felt weird, "Hey you four mid twenty year old men! Smile for the camera so I can put this on my blog!" It's not just with four dudes, I always feel real self conscious pulling out the cam cam. When I do, I snap a pic real fast and then hide my camera back away. Which is way my pics always turn out like crap. 3a. I have a DSLR, but feel like a fool any time I pull it out because I have no idea how to use it. 3b. I'm afraid someone will see me with my DSLR and call me a fake. Reason #4: I really really hate DIY. You should see me try to do any kind of craft. Thirty minutes into it I've got yarn tangled up, glitter spilled all over the floor, and fingers that are hot glued together. I invariably give up half way through the project, throw the cardboard with a hot mess of glue and buttons on it across the room, and then demand someone else finish it for me. It ain't pretty. Not to mention I leave a mess in my wake and only after a week of it sitting on the kitchen table does Greg decide he better clean it up for me because I ain't never revisiting it. Reason #5: I like to eat food. I don't necessarily like to cook it, and I certainly don't like to wait to eat it until after I have taken a picture of it. I also don't like to "invent" food. I have no imagination whatsoever when it comes to dinner. I can do a recipe that is already mapped out in its entirety. I have never nor will ever invent something in the kitchen. Reason #6: I don't blog on schedule. Ever. I can count on one hand the number of times I have had a post ready to go a day or more in advance. Did I say one hand? I meant one finger. Most of the time I open up my computer and stare at the blank screen and wonder, "now what should I write about today?" just like I did today. If I were a good blogger I would have this all figured out and planned and scheduled. Last week I talked to a blogging buddy of mine and she told me she writes all her posts for the week on Saturday. ON SATURDAY! Can you imagine the kind of determination and organization that that woman must have? I'm never going to get there, I'll tell you now! Reason #7: I have no idea how to do any kind of blog design. It's all I can do to copy and paste an html and I tell you what, that took me a whole year to catch on to. I have only one time made my own button and that was an all out disaster. I've got people who do that crap for me because I just can't figure it out on my own. And my, don't I sound official saying "I've got people?!?" Reason #8: As per the above mentioned comment, I get tired of my blog design after three months. Every time. I constantly go to a gross amount of effort and find someone nice enough to help me through many stages of blog design reform only to decide after three months that I don't like any of my original decisions. I am pretty sure people get confused when they come to my blog because I'm always switching it up on them. I don't even stick to the same color scheme either- I completely revamp this bad boy everytime I get sick of looking at my header. Someone help me when I have to design the living area of a home. Reason #9: Pretty sure I am the antithesis of link-up queen. I always forget how to link up, I never find the link ups on time, I'm never quite writing on the right topic. Then there's my own link ups I've tried to host. Don't even get me going there. I never put the link up gadget up right. What few people are nice enough to link up never even hear a peep from me because I'm so overwhelmed with the whole stinkin thing I never get to the point of actually commenting on the posts they linked up. It's a shame I tell you, a crying shame! Reason #10: I take on average, three days to respond to tweets and eight days to respond to emails. They are the bane of my existence. I could go on but Reason #11 I am a bad blogger is I blog too late at night and then I am exhausted and just want to go to bed and the post gets the raw end of the deal. Excerpts of this post originally posted on February 18, 2013. Reason #12 I'm a bad blogger is because sometimes I can't think of anything new to write so I repost stuff from a year ago and pretend like I had a recent stroke of genuis. I didn't. Well I hear you on almost every single one of these so apparently I'm rowing the same boat as you. The only ones I accomplish (somewhat) are DIY and designing. Everything else? I just nodded my head more times than preteen at a One Direction concert. Comments and emails are really tough for me too! I'll go days, sometimes weeks (eek! hate to admit that) before responding... or I'll have loads of post ideas but when it comes down to actually writing the darn thing I just delay and delay until all of a sudden it's been like a week since my last post (i'm in that cycle right about now). As for DIYs and blog design, that's where I just recognize my limits and pay people to do things for me. Don't beat yourself up Bonnie, at least you're posting 5x a week with a wicked following! I feel ya on about half of these. But I think I'm the worst because I just constantly talk about what's going on in my life and the weekends I spend with my roommates, and hope that other people still think it's fun to read about with no background. And the picture thing--unless I can convince a roommate to take pictures, all of mine are iphone pics. Oops. oh man, i was cracking up so hard at these. i haven't even been in "blog land" that long, but i can relate. i can do the HTML thing and my DIY skills aren't bad, but the rest? yeah. totally me too. i don't tell anyone i blog for the reasons you mentioned, and i definitely do the whole sly photo taking thing all the time! I'm a bad blogger too, I don't write well, I write about boring stuff and no one knows about it. But you know what, that's ok. I do it for me anyway so its all good!! Well this sounds exactly like me, except for that you have a "successful" blog and I just have a little blog that not many people read. You give us terrible bloggers hope Bonnie! I definitely can understand all of these- I think ost of them have happened to me too! When I feel like I'm being a bad blogger, I just remember that it's not that serious, the post can wait if it needs too, and if people want to read it then great, and if not, thats great too! You fraud! ;) Just kidding, I completely found myself saying "oh whoops" to at least half of these! # 1 reason you are a GREAT blogger though - humorous and entertaining content regularly!!! I hear you! So funny. I definitely feel you on the being a bad blogger thing. I started my blog back in 2010 and have been doing a pretty poor job with it ever since. This year however I think I have almost written more posts in 2 months that I have any other year... and by any other year I mean, any other year ALL year long. I also know NOTHING about blog design, how to make buttons, etc... so you are doing better than me there! I recently attempted to revamp my blog on my own... I am not happy with it, but hey, at least it is more me than using just a template! But keep doing what you are doing... I LOVE reading your blog (even though I rarely comment because until recently I was too nervous to really actually comment on other people's blogs for fear they would either a) think my comment was stupid or b) somehow stumble upon my blog and think it was stupid). But just keep doing what you are doing... you do great! Oh my goodness I hate taking out my camera and hearing will this end up on your blog (that is why there are so many pictures of my niece and nephew they don't say any of that), or this is going on the blog. And try not to tell anyone I know about my blog either so I don't have to admit how bad of a blogger I am. I definitely agree with the pictures! I either feel embarrassed, like a fake, or am enjoying the moment too much to remember to pull out my camera and take pictures...also, my link for my ad on your sidebar isn't working, so I emailed you a new code for it. I definitely have been a bad blogger too, I'm getting better though! I'll be "meeting" you during the Blogging Happy Hours next week! I'll be the one drinking Dr. Pepper lol! Also I may be super awkward! We can all identify with being a bad blogger. I completely get the going out to eat story. we went out with some of the hubs co-workers and it was hilarious. I wanted to take pics and blog about it but it would be awkward & we just met. Bonnieeeeee. I told you, if I have even three weeks I can totally make it out for one of these. Maybe April :) - although I have a feeling Easter might get in the way. OMG you are ME. your post says everything I think of myself and my 'blog'.